Strong, lightweight and easy to post in the ground. Our stakes are 23" x ¾" x ¼", all natural wood and knot free. They are perfect to use in the garden to stake plants like tomatoes and other vegetables. Also great for staking trees, shrubs and vines and keeps plants from falling or bending. You can write on them. Label your plants with name, variety & date or just mark your garden rows. Use the front and back to get all your information on them. Stakes can also be used to mount or post any sign like garage or yard sale, real estate or house for sale, Keep Off The Grass or For Sale signs. Also great for general landscaping or as survey markers. 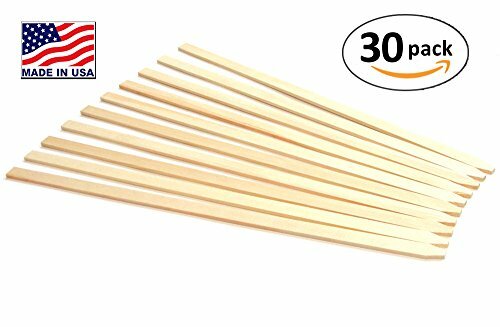 Stakes are environmentally friendly and biodegradable unlike metal, PVC or plastic bamboo stakes. With 30 stakes in the pack, there are enough for any job. Our stakes are also Made in the USA with American Timber. Strong, lightweight and easy to post in the ground. Stakes are 23" x 3/4" x 1/4", all natural wood, knot free. Use to mount or post any sign like garage or yard sale, real estate or house for sale, Keep Off The Grass or For Sale signs. Also great for landscaping and as survey markers. Perfect to use in the garden to stake plants like tomatoes and other vegetables. Also great for staking trees, shrubs and vines. Keep plants from falling or bending. Write on them. Label your plants with name, variety & date or just mark garden rows. Can write on the front and back.